The biggest part of the musicianship is the music itself. And this is the reason you should consume it as much as you can. Music builds music. The veriest act of creating music is listening to it. Listening to music builds an immense universe of culture within your brain which could be used on a subconscious level at the moment of creating music and performing it on your guitar. You will always compare what you play to what you’ve been listening to. Because that’s the beauty of music: it is all connected. All the time. 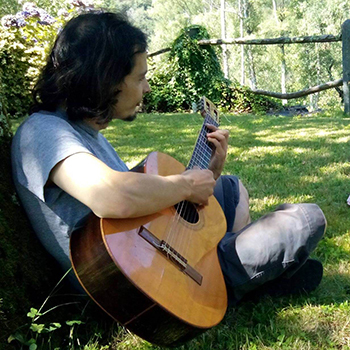 Ivo is a dedicated guitar player & teacher for more than 25 years. He started playing piano at the age of seven. Five years later he had his first guitar performance with a local band. During his journey, Ivo had different bands and projects, going through different styles of original music. All this time he gave private lessons occasionally. In 2013 he started teaching guitar at Rockschool.bg. For 5 years of teaching, he worked with more than 300 students – beginner, intermediate and advanced.